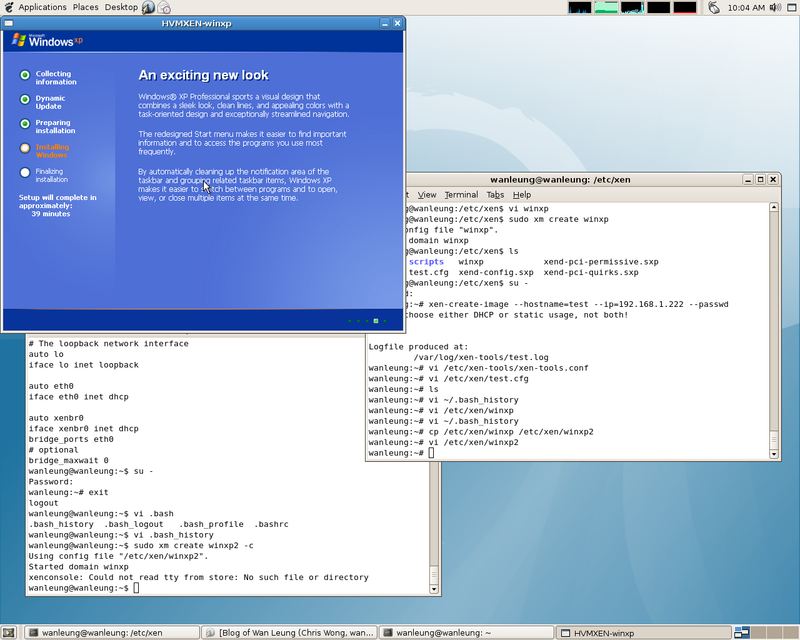 Here is the instruction for running XEN on Debian Etch on Core2Duo 6300 with 2GB Ram. First, install all the packages that related to XEN. Then, boot reboot the machine and choose the pae kernel to boot. Next, add the following into /etc/network/interface for the Xen Bridge neteork. Configurature /etc/xen-tools/xen-tools.conf collectly such as kernel version and initrd. to make sure all the Tag are correct. As Core2Duo 6300 support VT, we could run Windows under Xen. first, build an image file for windows. to boot up the VM and install XP. This entry was posted in Computer and tagged Debian, Linux. Bookmark the permalink.